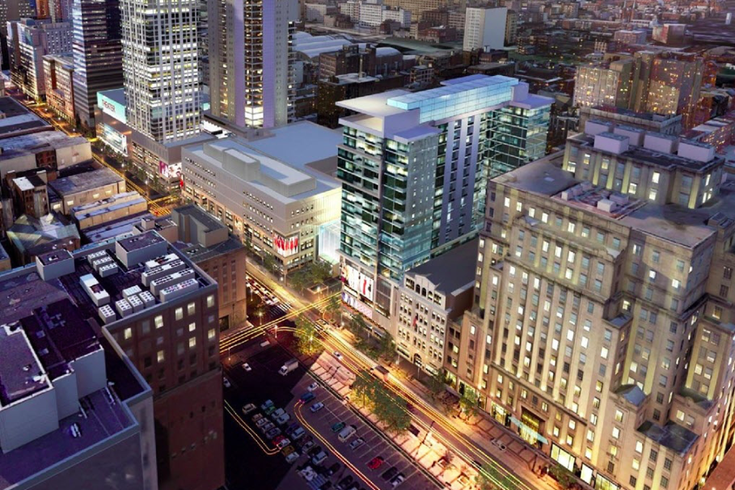 Aerial rendering of Fashion District Philadelphia. After more than three years of planning and construction, Fashion District Philadelphia has an official opening date set for Sept. 19, 2019. Work on the former Gallery mall has taken over much of the area around its address at 1101 Market St. in the years since the concept was first announced in summer 2015. Though much of the exterior work and space booking has been completed, officials told Philly Mag that the retail center still has about 10 months to go before opening. A reported 85 percent of the Fashion District Philadelphia space, accounting for approximately 700,000 square feet, has been leased. Developers for the project, which is priced between $400 and $420 million, are confident they will meet the Sept. 19 start date. Vendors confirmed for the new space include City Winery, an urban winery and concert venue. There will also be a Dallas BBQ location, an AMC theatre, and an unnamed artisanal Italian market, among several other concepts. Burlington Stores, Century 21, and Tiffany's Bakery are currently open at the space. Learn more about the project here.